Smartphones are essential to mobile internet growth, and the related economic development that these devices enable within emerging markets. That being said, there's also a significant segment of the developed markets that favors lower-cost devices with 'good enough' features and performance. Mobile phone vendors shipped a total of 347.4 million smartphones worldwide in the first quarter of 2017 (1Q17), according to the latest market study by International Data Corporation (IDC). According to the IDC assessment, consumers continue to show demand for smartphones and vendor flagship hype seems strong as ever. 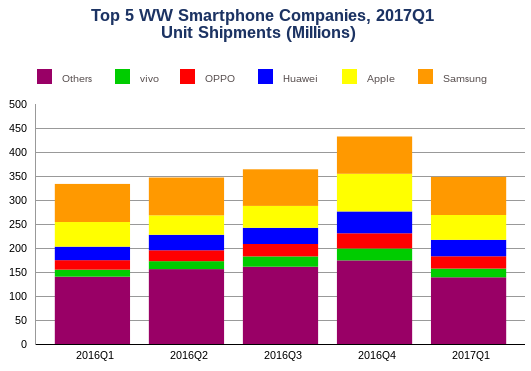 Worldwide smartphone shipments grew 4.3 percent in 1Q17, which was slightly higher than IDC's previous forecast of 3.6 percent growth. "The first quarter smartphone results further prove that the smartphone industry is not dead and that growth still exists," said Ryan Reith, program vice president at IDC. "There is no question that 2016 was a pivotal year for the industry as growth dipped to low single digits for the first time." However, analysts believe that the industry will rebound in 2017, and the strong first quarter results tend to support this possibility. In addition to what shipped in 1Q17, product announcements from Huawei with the P10 devices and Samsung with the Galaxy S8 devices demonstrate that innovation is still possible. And, despite any formal announcements from Apple, it is safe to say the industry is anticipating what comes next from this year's iPhone announcements. Let's hope, for Apple's sake, that they're not disappointed. IDC continues to see the largest catalysts being a handful of Chinese smartphone OEMs. The clear leaders are Huawei, OPPO, and vivo, which have all well outpaced market growth for over a year. As these companies gain share in new territories, the potential to continue this growth trend is high. "Although we have seen an abundance of premium redesigned flagship phones that just entered the market, moving forward, we still expect most of the growth to come from more affordable models in a variety of markets" said Anthony Scarsella, research manager at IDC. Despite all the popularity and media hype around premium smartphones, we are seeing a shift in many mobile phone vendor portfolios geared towards lower-cost devices with premium-type styling compared to flagship models. This is the 'good enough' product category that's driving new demand. IDC says that the leading companies have started to implement a single premium design language that blurs the lines between the high-end and the low-end devices, allowing the average consumer to adopt the brand without a hefty investment.